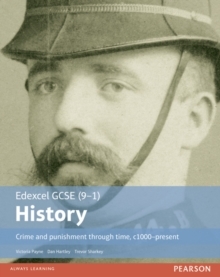 Exam Board: EdexcelLevel: GCSESubject: HistoryFirst teaching: September 2016First exams: Summer 2018 Series Editor: Angela LeonardThis Student Book: covers the essential content in the new specification in an engaging way, using detailed narrative, sources, timelines, key words, helpful activities and extension material uses the 'Thinking Historically' approach and activities to help develop conceptual understanding of areas such as evidence, interpretations, causation and change, through targeted activities has 'Writing Historically' features that focus on the writing skills most important to historical success. This literacy support uses the proven Grammar for Writing approach used in many English departments includes lots of exam guidance, with practice questions, sources, sample answers and tips to support preparation for GCSE assessments. * These resources have not yet been endorsed. This information is correct as of 31st July 2015, but may be subject to change. You do not have to purchase any resources to deliver our qualification.